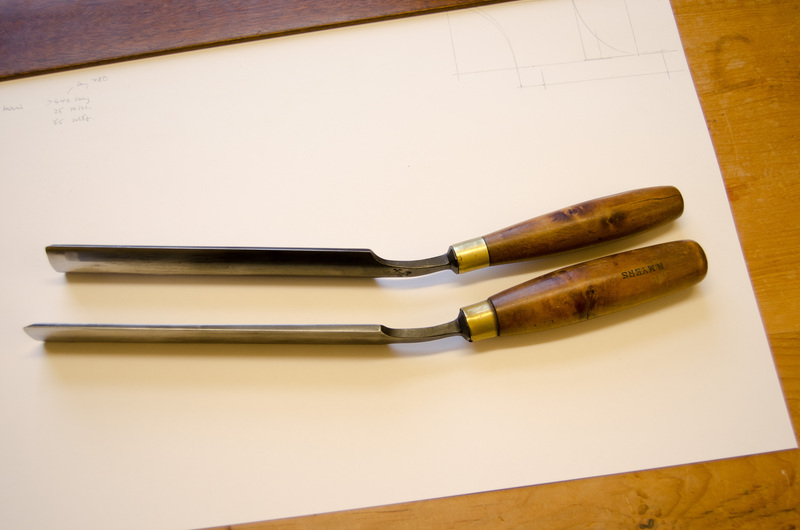 Pattern makers often used long gouges and chisels with a crank between the blade and the handle. This allowed them to operate the tool deep into a workpiece without the handle catching on the edge. In his Dictionary of Tools, R. A. Salaman calls them trowel-shanked, but one often hears them referred to as cranked or crank-handled too. 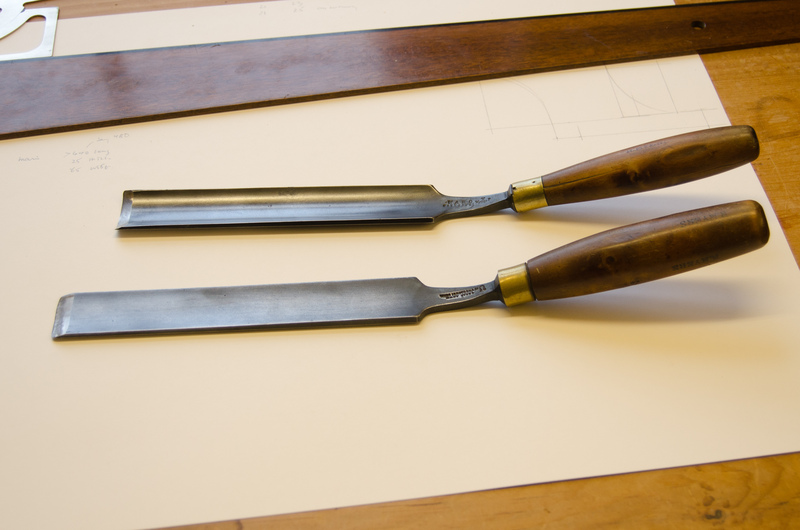 I’ve got a couple of long in-cannel gouges which I suspect were originally straight and later modified to achieve the same end. Perhaps R. Myers (the name stamped on the handle of the gouge) needed a tool with a cranked shank in a hurry, didn’t have time to obtain one, and so decided to make the best of what he had. The steel at the bent part of the shank is dark and discoloured, which supports the idea because it would surely have been necessary to heat the shank to bend it successfully. Mr Myer’s talent for improvisation and economy prompted me to try something similar with a small chisel blade. I’d often thought that a small crank-handled chisel would be the perfect tool for cleaning up squeezed out glue when putting braces and harmonic bars on guitar soundboards but the only ones that I had come across were too big for what I had in mind, and too expensive as well. I removed the handle from the chisel, wrapped the blade in a wet rag to prevent the important part of the tool losing its temper and then, after heating the shank to red heat with a propane torch, bent it up about 15°. When it had cooled, I put the handle back on and was delighted to find that it worked just about as well as I hoped it would. The flat underside of the blade acts as a jig and prevents it digging in, and the raised handle allows it to be used in places where accessibility is restricted.